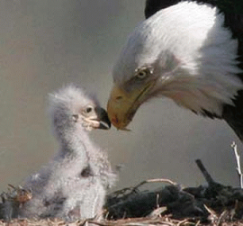 Archival photo of eaglet and parent, before the extinction (from approximately 2014), by Lee’s Birdwatching Adventures Plus. Levant Davis gently rearranged the simulated nest but wasn’t having much luck with the lone egg. As lead researcher for the Lorax Project, even he could do only so much prodding of natural processes. The recovered eagle DNA from which he’d helped create Phoenix, first of her kind in 22 generations, was rebelling in her parthenogenetic offspring. He hid his hopes. Emotions aren’t data. Flash fiction written for the Light and Shade Challenge of 19 September 2014. My gratitude to the Raptor Resource Project Blog and the American bald eagle resource unit from The Learning Technology Center at Vanderbilt University, which provided invaluable data in which to “ground” this flash.